Chou-fleur, as the French would say. Yes, sadly, the kid had cauliflower ears. Enough said. 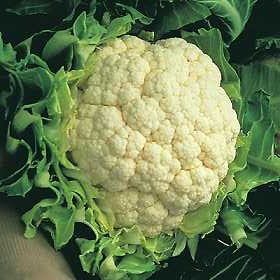 When my mother did feature cauliflower on the menu, it was boiled good and long, like every hard-working, middle-class North American family did with most vegetables throughout the ’60’s and ’70’s. 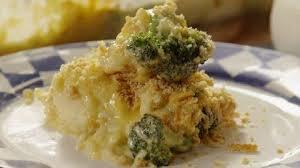 But the piece de resistance – and still alive and well and a crowning jewel on many a dining table today – was the the gold star cauliflower and broccoli casserole: a gooey mix of vegetables, milk, cheese, Campbell’s cream of mushroom soup, and topped with crispy fried onions. Today, the grown-up me happens to adore cauliflower. While not the prettiest vegetable in the market – fat, unwieldy, heavy, cumbersome, and so on – the cauliflower is such a versatile and nutritious plant food. It’s subtle taste can be elevated to the heavens by pairing it with flavourful spices, herbs, condiments and sauces. In a (health) nutshell: this cruciferous vegetable is loaded with vitamin C, a powerful antioxidant that boosts the immune system, and necessary for the growth and repair of tissues throughout the body. It is also boasts high fiber, potassium and folic acid. 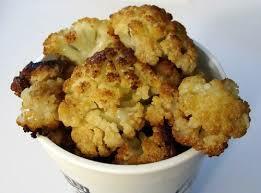 Cauliflower is anti-inflammatory, anti-oxidant and detoxifying. Honour your health by making this vegetable a regular on your plate, both in raw form and lightly cooked, several times throughout the week. I eat it as ‘rice’ these days – a quick pulsing of florets in the food processor brings the cauliflower to a rice-like consistency. Pour into a heated and virgin coconut-oiled pan, add sea salt, pepper, a hit of nutritional yeast (or parmesan for the dairy folks) and yum – there’s your rice. And then there’s cauliflower mash. Instead of starchy potatoes, toss your lightly-steamed florets into the blender. Add a small glug of extra-virgin olive oil, a garlic clove, sea salt, pepper, nutritional yeast…and there’s your side of mash. And then…just eat it raw. Cauliflower dipped in a freshly made guacamole is heaven. Mash up an avocado, add a spritz of fresh lime juice, some finely chopped onion and tomato, garlic, sea salt and pepper – and dunk away! That’s lunch. Preheat oven to 350 degrees. Mix florets in large bowl with oil and sea salt, until fully coated. Spread florets onto parchment paper-covered baking sheet (for easy clean-up); sprinkle nutritional yeast evenly over top. Bake in oven for about an hour until florets are golden brown, turning every 2o minutes or so. These are so, so, so delicious!